The remains of a 20-year-old woman who lived in Sweden 5000 years ago has been found with the bacteria that causes the plague in her DNA. The international team of researchers say this is the closest strain to the genetic origin of the plague that has been found. They suggest this strain may have coincided with a known decline of European mega-settlements as poor sanitation and high population would have created the perfect environment for the disease to spread. A team of researchers from France, Sweden, and Denmark have identified a new strain of Yersinia pestis, the bacteria that causes plague, in DNA extracted from 5,000-year-old human remains. Their analyses, publishing December 6 in the journal Cell, suggest that this strain is the closest ever identified to the genetic origin of plague. Their work also suggests that plague may have been spread among Neolithic European settlements by traders, contributing to the settlements' decline at the dawn of the Bronze Age. "Plague is maybe one of the deadliest bacteria that has ever existed for humans. And if you think of the word 'plague,' it can mean this infection by Y. pestis, but because of the trauma plague has caused in our history, it's also come to refer more generally to any epidemic. The kind of analyses we do here let us go back through time and look at how this pathogen that's had such a huge effect on us evolved," says senior author Simon Rasmussen (@simonrasmu), a metagenomics researcher at the Technical University of Denmark and the University of Copenhagen. 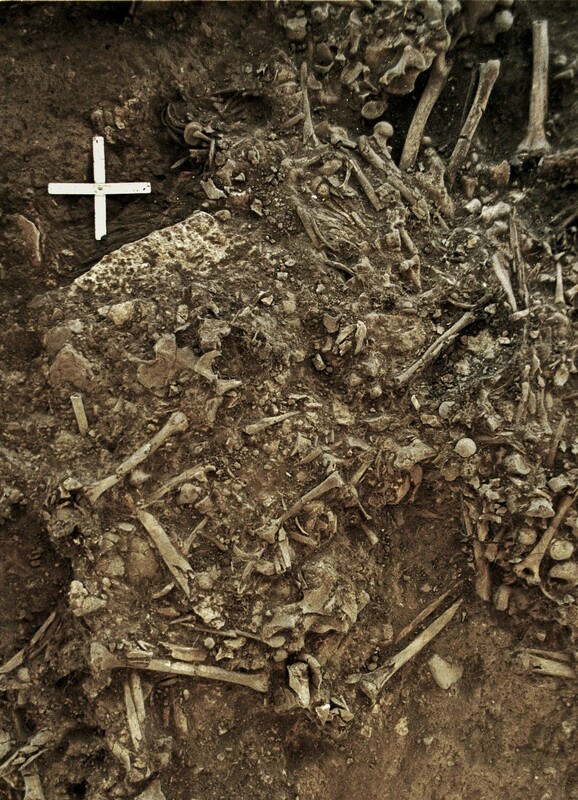 To better understand the evolutionary history of the plague, Rasmussen and his colleagues trawled through publicly available genetic data from ancient humans, screening for sequences similar to more modern plague strains. They found a strain they had never seen before in the genetic material of a 20-year-old woman who died approximately 5,000 years ago in Sweden. The strain had the same genes that make the pneumonic plague deadly today and traces of it were also found in another individual at the same grave site--suggesting that the young woman did likely die of the disease. This strain of the plague is the oldest that's ever been discovered. But what makes it particularly interesting is that, by comparing it to other strains, the researchers were able to determine that it's also the most basal--meaning that it's the closest strain we have to the genetic origin of Y. pestis. It likely diverged from other strains around 5,700 years ago, while the plague that was common in the Bronze Age and the plague that is the ancestor of the strains in existence today diverged 5,300 and 5,100 years ago, respectively. This suggests that there were multiple strains of plague in existence at the end of the Neolithic period. Rasmussen also believes that this finding offers a new theory about how plague spreads. Massive human migrations from the Eurasiansteppe down into Europe are known to have occurred around 5,000 years ago, but how these cultures were able to displace the Neolithic farming culture that was present in Europe at the time is still debated. Previous researchers have suggested that the invaders brought the plague with them, wiping out the large settlements of Stone Age farmers when they arrived. But if the strain of plague the researchers found in the Swedish woman diverged from the rest of Y. pestis 5,700 years ago, that means it likely evolved before these migrations began and around the time that the Neolithic European settlements were already starting to collapse. At the time, mega-settlements of 10,000-20,000 inhabitants were becoming common in Europe, which made job specialization, new technology, and trade possible. But they also may have been the breeding ground for plague. "These mega-settlements were the largest settlements in Europe at that time, ten times bigger than anything else. They had people, animals, and stored food close together, and, likely, very poor sanitation. That's the textbook example of what you need to evolve new pathogens," says Rasmussen. Eventually, he suggests, the plague would have arrived through these trade interactions at the small settlement in Sweden where the woman his team studied lived. Rasmussen argues that the woman's own DNA also provides further evidence for this theory--she isn't genetically related to the people who invaded Europe from the Eurasian steppe, supporting the idea that this strain of plague arrived before the mass migrations did. The archaeology also supports this hypothesis, as there were still no signs of the invaders by the time she died. Regardless, he believes that this study is a step toward understanding how plague--and other pathogens--became deadly. "We often think that these superpathogens have always been around, but that's not the case," he says. "Plague evolved from an organism that was relatively harmless. More recently, the same thing happened with smallpox, malaria, Ebola, and Zika. This process is very dynamic--and it keeps happening. I think it's really interesting to try to understand how we go from something harmless to something extremely virulent."